It is an open secret that Arya and Santhanam share a lot of Bro mance between them. One more leaf out of that book was revealed in Pondicherry in the sets of ‘Inimey Ippadithaan‘ starring Santhanam and Ashna Zaveri. 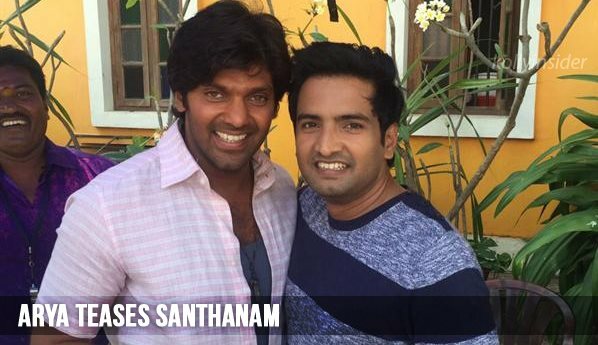 Arya who was shooting near by for his ‘Yatchan‘ decided to take some time off to visit Santhanam. It was not the normal courteous visit but a well planned attack to bully his best pal Santhanam. Santhanam was busy rehearsing and shooting for a song, enter Arya all hell broke loose in the sets. Arya took over the mega phone and started demanding much more and more from the dancing Santhanam. Santhanam with his new found histrionics of dancing tried to match the new master Arya’s dictations until his energy ran out . He found that Arya was actually playing a revenge prank on him, for all that he had played on Arya in the screen.